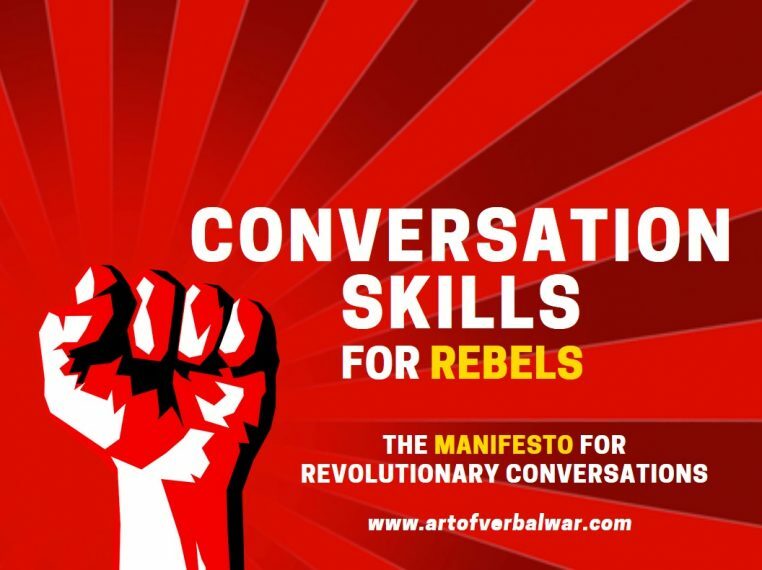 Its time for a revolution in conversation skills advice. We’ve been misled by the existing “regime” and I’m here to set you all straight. As a verbal skills coach, I get numerous e-mails and messages every month from readers and subscribers asking me how to improve their conversation skills. It seems like many people are struggling with this area of verbal skills. And, yet we wonder why? The conventional wisdom about conversation advice and conversation skills is just flat out incorrect. Everywhere you look, Reader’s Digest, Time Magazine, AskMen, Fast Company, you will find half-baked, virtually useless advice. 1. Be interested in others. 4. Know and use interesting conversation topics and conversation starters. 5. Talk about and share your passions and interests. 7. Be polite and inoffensive. I’m sure you’ve seen and read these bits of advice many times, right? And, I bet you even tried quite a few of these tips in your real life conversations. Now, after you used these tips, did your conversational skills actually improve? Most importantly, did your conversations themselves get better? Conventional conversation advice is fine and dandy…IF you want to be a MEDIOCRE conversationalist and have SUBPAR conversation skills. I sure don’t and I bet neither do you. We don’t do mediocre around here. While it is not wrong to be interested in other people and their lives, how does this advice actually improve your own conversation skills? The reality: What this advice does is transform you into a passive participant in a conversation, but it sure doesn’t make you into a better conversationalist. Similar to the first tip, this advice does not make you a better conversationalist and it also makes you a passive participant. I hate these first two tips the most because they are probably the two most well known conversation “tips”, yet all they do is to make you into someone who places the burden of making conversation on other people. Don’t ever put the burden of making conversation on others. You need to start taking OWNERSHIP of every conversation that you get in from here on out, and that means going far beyond mere listening. Somebody who asks lots of questions in conversation is most likely somebody who has nothing to say, no value to give, and again, burdens others with the responsibility of leading the conversation. You may think that by asking aimless questions, you are leading a conversation. You may think that by asking lots of questions, that you are showing that you care about other people’s opinions, interests, and lives. But, this is not the case. While this is not terrible advice, the problem with memorizing “good” conversation topics and conversation starters is that it lacks flexibility. There is no such thing as a bulletproof conversation topic or conversation starter. A topic that seems interesting to you could be like a sleeping pill to someone else. A conversation starter may work well in one situation, but be completely useless in another. Knowing “good” topics and starters is not the panacea you may think it is. Instead, you need to know how to take any topic, even the most mundane topic, and weave it into an interesting, fun, and exciting conversation. Just like “good” conversation topics, sharing your passions and interests have the same fundamental problem. Your interests may not be other people’s interests. Even more egregious than that, when you talk too much about your passions and interests, especially in an aimless way, the conversation becomes a one-way street and not a two-way exchange. The greatest conversationalists can conjure up a great conversation without talking about themselves or any “good” conversation topic. Great conversationalists can make something (great) out of nothing. It is all the rage right now to hear advice about how you “should tell stories”. Yes, stories can be quite fascinating and interesting. However, as with anything else, most people take things to extremes and they will tell stories aimlessly or go so far with their storytelling that it becomes a one-way street (just like people talking about their passions and interests). It is okay to tell stories, but only when stories serve a specific purpose within the context of a conversation, and not just for the sake of telling stories. Being too polite, politically correct, and inoffensive is the biggest killer of a dynamic conversation. I can’t think of a type of conversation I dislike more than one where all the participants are afraid to say anything even remotely edgy. I think I’d rather listen to someone’s rambling, pointless story than to participate in a conversation where nobody is willing to take any risk and is content to have a completely vanilla conversation. Some people like to think “deep conversations” are the best and only kind of conversations that people should have. At least 95% of the time, I prefer to have a different type of conversation than a “deep conversation”, which you will learn about now. I don’t know about you, but I’m so done with conventional conversation advice. Go ahead and cling to this gospel if you think this advice helps you. It never helped me at all. My conversation skills never improved when I followed this advice. All it led me to have was mundane, uninteresting conversations with people, including those with girls. Look: If you want to actually have interesting, fun, and exciting conversations with other people, its not actually that difficult. But you have to discard the nonsense about conversation skills that other people feed you. It’s time for a revolution in conversational skills! 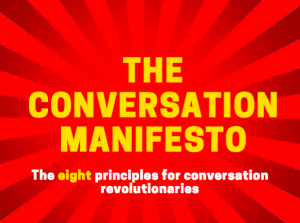 Let’s talk about how we can overthrow the conventional wisdom on conversation skills. Instead of conforming the existing “regime”, it’s time to rebel and create a new paradigm for conversations. 1. Instead of being so damn interested in others, focus on being interesting YOURSELF. 2. Instead of trying so hard to be a good listener, focus on HAVING SOMETHING TO SAY. 3. Instead of asking lots of questions, use questions INFREQUENTLY and only in certain specific situations. 4. Instead of worrying about knowing good conversation topics and starters, learn HOW TO TALK ABOUT ANYTHING IN AN INTERESTING WAY and HOW TO CREATE A SPECIAL CONVERSATION OUT OF NOTHING. The truth is that it is not certain TOPICS that matter, but it is certain TYPES of conversations that light up everybody’s eyes in a conversation and make them want to take part. 5. Instead of sharing your passions and interests in a monologue-type of conversation, learn to CREATE TWO-WAY CONVERSATIONS that get everybody else involved. 6. Instead of telling aimless, pointless stories, tell stories in a PURPOSEFUL FASHION. 7. Instead of worrying about being polite and inoffensive, you need to GET A BIT EDGY with your conversations going forward. 8. Instead of focusing on having “deep conversations”, focus on having FUN, EXCITING, AND EDGY conversations. Do you want to know HOW to implement each of these eight principles? If so, click HERE to get my free special report, The Manifesto For Revolutionary Conversations. NEVER HAVE ANOTHER MUNDANE CONVERSATION AGAIN! Remember, its not the TOPIC of conversation that matters, but the TYPE of conversation that matters!